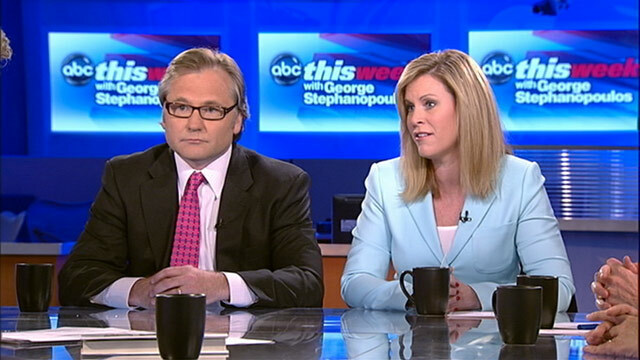 Obama Deputy Campaign Manager Stephanie Cutter and Romney Campaign Senior Adviser Eric Fehrnstrom on "This Week with George Stephanopoulos." ROMNEY: Let's keep America strong. Let's have a president that knows what it takes to get America to work. ROMNEY: Heads and his cronies win, tails and the taxpayers lose. (UNKNOWN): The Massachusetts record was alarmingly weak. STEPHANOPOULOS: Grim news on jobs rocks the presidential race. OBAMA: Our economy is still facing some serious headwinds. ROMNEY: The president's policies and his handling of the economy has been dealt a harsh indictment this morning. OBAMA: Is Obama to blame? Can Romney do better? The campaign strategists come to "This Week" for their first debate, Stephanie Cutter for Obama and Eric Fehrnstrom for Romney join our powerhouse roundtable, with George Will, Paul Krugman, and Donna Brazile. Plus, John Edwards gets off. OBAMA: George W. Bush gets some laughs. OBAMA: And Mike Bloomberg starts a soda war. All that right now on "This Week." Just about five months before Election Day, that jobs report on Friday was a gut-check for President Obama. It reminded all of us what this campaign is really about and just about guaranteed the race will be a nail-biter all the way. The latest polls show a dead-even contest, a country on edge, anxious and divided as ever, not thrilled with President Obama's leadership, not sure Governor Romney has any better answers. Here to make the case for their candidates this morning in their first debate from the Romney campaign, senior adviser Eric Fehrnstrom, Obama deputy campaign manager Stephanie Cutter. They join our regulars George Will and Paul Krugman, Nobel Prize-winning author of new book "End This Depression Now," just told me it's a best-seller in Spain. And, Stephanie, let's get to the economy, and let me begin with you. Right after that jobs report came out on Friday, Governor Romney did respond. He said, "This president is responsible for the fact that this recession has gone on so long and is hurting so many people." Your response? CUTTER: Well, George, I think the president said it best on Friday that, you know, we are still in a recovery period. Over the past 27 months, we have created 4.3 million private-sector jobs. The issue is that we're not adding jobs fast enough. If you looked at the report on Friday, the areas where we are doing well are areas that we've been able to affect policy. Manufacturing jobs continue to rise. And that's precisely because the president stepped in and did what nobody else was willing to do to save the auto industry. And that has had a great impact on manufacturing jobs up and down the supply chain. Now, that report also showed areas that are still hurting, particularly teachers and construction workers. And that just shows the wisdom of the president's policies, because we have two very -- two policies sitting on the desk of Congress right now that they could act on to put teachers back to work and put construction workers back to work rebuilding our roads, bridges and highways. STEPHANOPOULOS: Let's get Eric to respond to that. What do you make of that? Governor Romney's been quite critical of what the president did with the auto industry. FEHRNSTROM: Well, I agree with Stephanie, first, that this president is not adding jobs fast enough. And I think for anybody who is urgently waiting for improvement in the economy, last week was not a good week. And it's not just the devastatingly weak jobs report we got on Friday. It was also the revision in GDP downward for the first quarter. It's a drop in consumer confidence. It was an increase in unemployment claims. STEPHANOPOULOS: On all of those? STEPHANOPOULOS: I want to get in more on the records in a moment, but let me turn it over to George Will now, because this comes at a point, this May jobs report, where perceptions usually get baked in, in a presidential race. WILL: Exactly. And no matter what Congress does, nothing the government can do is going to change the trajectory of the economy right now. Since the Second World War, no president has been re-elected with the unemployment rate over 7.4 percent. What we learned this week is for sure it's going to be over 7.4 percent. We now have 40 consecutive months of 8 percent unemployment or more. The average workweek went down. As you're right, they revised downward the first quarter GDP. They also revised downward the jobs creation in April. So there was simply nothing in this report to give people confidence. And what it does begin to answer is a question. Is this going to be 1984 or 1980? 1984, when Reagan could run after a deep recession, on the morning in America and the revival has begun, or would it be 1980, with a sense of stagnation and permanence in stagnation, and it looks increasingly like 1980. STEPHANOPOULOS: Let's get to the economist, then. Where is the economy right now? STEPHANOPOULOS: Let me show you -- we have a chart in your blog this morning. STEPHANOPOULOS: We created it. It shows the point you're making. KRUGMAN: Yeah, this is real government spending, so it's federal, state and local combined, deflated, you know, adjusted for population growth and inflation, and it is plunging. It's plunging mostly because of cutbacks at the state and local level, because the aid that they were receiving in the stimulus has run out, but also because unemployment benefits have been expiring because Congress won't -- you know, Republicans in Congress won't extend them. So in effect -- and, by the way, if you extend that chart backwards, there's been nothing like this since the demobilization after the Korean War. We're actually practicing government austerity on a scale that we haven't seen in 60 years. It's not the president's policy. In effect, we've already got the policies that Republicans say they will impose if they take the election, and yet, of course, it may lead to the defeat of this president. STEPHANOPOULOS: And that's the point Stephanie was making, so bringing it back to you, what would Governor Romney do right now -- not in the future -- right now, to get the economy moving again? FEHRNSTROM: Well, it's not just, as Paul says, tax policy. That's part of it, of course, but it's also spending policy, it's regulatory policy. It's confronting China on their unfair trade practices. It's -- it's a whole -- it's labor policy, George. FEHRNSTROM: What we -- what we -- what we really have here is a deficit in leadership. And this president came into office without any prior experience running anything. He never even ran a corner store. And I think it shows in the way that he's handling the economy. STEPHANOPOULOS: Can the president do anything now? WILL: How about the -- how about the Keystone pipeline? You don't need Congress to do that. CUTTER: That's a fraction of the jobs that could be created by these proposals. WILL: But pretty important to those that get those jobs. CUTTER: And we -- and we have, you know, extended the Keystone pipeline at different points in the country. It's currently under review. But that's a fraction of the jobs that we're talking about here. We're talking about a million jobs. KRUGMAN: Can I just say, on the Reagan thing, if public-sector employment had continued to expand the way it did during Reagan's first term, instead of falling by about 600,000 as it has, right there we'd have something like 1.4 million people working in this country. So if you actually look at the actual track record of government spending, government employment, Reagan is the Keynesian and Obama -- mostly because of political constraints, although a little bit of lack of conviction on the part of his own people, has been the anti-Keynesian. He's been the one who's been doing what Republicans say is the right answer. STEPHANOPOULOS: But doesn't -- but -- you got to the point at the end. I think the danger of that argument -- you were making part of it right now -- is that the more you blame Congress and nothing gets done, the weaker you look. FEHRNSTROM: Could I say, George, just on -- on that point? I do think it's important for Republicans in Congress to come together with the president on some bipartisan jobs legislation. The problem is, this president has made it nearly impossible to do that because of the way he demonizes his opposition, his personal attacks against Paul Ryan. I can tell you that when Mitt Romney was governor of Massachusetts, he had to confront a Democratic legislature. Every week, he would invite the Democratic leaders to come into his office. They would discuss agenda items. If they didn't have an agenda to discuss, they would talk about the last movie they saw. But the important thing was to keep those lines of communication open. This president hasn't done that, and I think it's -- we're for the worse. CUTTER: Well, in terms of the governor's Massachusetts record, I think that the Democratic leadership in Massachusetts would probably tell you a different story about Mitt Romney's ability to reach across the aisle. The number of vetoes of the Democratic legislature says it all. On the president working with Republicans, it's been clear since day one that the president was willing to reach out to Republicans, work with them on critical pieces of legislation to get our economy moving. Time and time again, they've rebuffed him. Now, whether you're talking about the secret meeting that they had on the day of the president's inaugural to figure out how they were going to defeat him or Mitch McConnell saying that his number-one goal to make the president a one-term president or bringing the economy to the brink of disaster last summer and resulting in a reduction in the nation's credit rating because Speaker Boehner couldn't get his Republicans together to do -- ensure that everybody paid their fair share and ensured this economy could keep moving. STEPHANOPOULOS: Let's talk about the plan going forward, because you mentioned the Ryan plan, the demonization of the Ryan plan, in your -- your words. Is Governor Romney saying that is going to be his blueprint for the budget going forward? FEHRNSTROM: Well, at least he has a blueprint. The president hasn't produced a budget or at least a budget he did produce -- or the outline of the budget he produced was rejected unanimously in both branches. Look, we need to restraint growth in government spending. If we -- if we're concerned about what's happening in Europe, if -- if we're concerned about Greece, if we're concerned about Spain, then we ought to rein in our spending now and get our debt and deficit down, or else we'll head down the same -- the same path as Europe. STEPHANOPOULOS: ... I want to bring in George Will. KRUGMAN: I was very much for that. I've been demanding that we declare -- but the window for that has passed. Right now, the Chinese economy is tanking. So if you were thinking you were going to get a big boost out of beating up on the Chinese now, two years ago I thought was really a good time to do that. But my god, now that is totally out of date. CUTTER: And how do you explain the governor's comments that -- when the president did take action, enforcement action against the Chinese when they were dumping tires in this economy, that the governor called that protectionism? FEHRNSTROM: Well, the governor has -- has -- has promised that he would confront China in ways that this administration has not. He can -- the president has the power right now through his Treasury Department -- he doesn't need Congress to act -- to declare China a currency manipulator. They are playing fast and loose, giving themselves an unfair advantage, and that's hurting American jobs. WILL: The president has had a lot of discretion and used it vigorously with -- not just with Solyndra that Mr. Romney went out to dramatize this week, but this week the Wall Street Journal had a long article on $1,260,000,000 invested in car batteries for electric cars. Now, there's a big supply of the batteries; there's a small supply of the cars. Complete mismatch and lots of money lost. On another matter, I didn't hear a robust answer to George's question. Where does the governor stand, Governor Romney, on the Ryan plan? Does he endorse it? FEHRNSTROM: Oh, he's for -- he's for -- he's for the Ryan plan. He believes it goes in the right direction. The governor has also put forward a plan to reduce spending by $500 billion by the year 2016. In fact, he's put details on the table about how exactly he would achieve that. So to say he doesn't have a plan to -- a plan to restrain government spending is just not true. KRUGMAN: Can I say, the Ryan plan -- and I guess this is what counts as a personal attack -- but it isn't. It's not an attack on the person; it's an attack on the plan. The plan's a fraud. The plan is a big bunch of tax cuts, some specified spending cuts, basically for poor people, and then a huge magic asterisk which is supposed to turn into a deficit reduction plan, but, in fact, if you look what's actually in it, it's a deficit-increasing plan. And so to say that -- just tell the truth that there is really no plan there, neither from Ryan, nor from Governor Romney, is just the truth. That's not -- if that's -- if that's being harsh and partisan, gosh, then I guess the truth is anti-bipartisanship. FEHRNSTROM: So may I ask you, Paul, do you prefer the president's plan? KRUGMAN: Oh, yeah. I mean, the president -- at least it's -- you know, I don't approve of everything, but there are no gigantic mystery numbers in his stuff. We do know what he's talking about. His numbers are -- you know, all economic forecasts are wrong, but his are not -- are not insane. These are -- these are just imaginary. FEHRNSTROM: Well, this president has given us four years of trillion-dollar deficits. Never before -- not until Barack Obama came into office -- have we ever achieved a $1 trillion annual operating deficit. That's what we have under this president. At least the Paul Ryan plan puts us on a path toward a balanced budget. It gets those annual deficits down. FEHRNSTROM: ... in a way -- in a way -- in a way that this president has been unable to do. WILL: With his predictions about what his stimulus would accomplish, what his green jobs programs would accomplish, the president gave a lot of hostages to fortune, and fortune has shot the hostages. Now, when -- when Trotsky, one of the leaders of the Russian revolution, made lots of predictions, and his -- his biographer, Isaac Deutscher, who loved Trotsky, said, proof of Trotsky's farsighted is that none of his predictions have come true yet. I think Mr. Obama is farsighted in the same way. STEPHANOPOULOS: When he said that unemployment would go below 8 percent. WILL: Stay below 8 percent. KRUGMAN: But they -- they were -- they were wildly over-optimistic about the ability of the private economy to recover on its own, but the mistake they made was that they said that even without the stimulus unemployment would fall sharply. And that was -- I don't know why they believed that, but this is not a problem with the president's policies, and it is something that a couple of economists put together in January 2009. Is that still what we're going to run on? STEPHANOPOULOS: I want to dig into a little more of what happened this week when both campaigns went in to rival territories. I said at the open, we had David Axelrod go to Massachusetts, talk about the Massachusetts record, Mitt Romney go to Solyndra, talk about the president. Take a look. AXELROD: The state was 47th in job creation, fourth from the bottom. Under Romney's tenure as governor, Massachusetts's economic performance was one of the worst in the country. ROMNEY: This building, this half-a-billion-dollar taxpayer investment, represents how the president thinks about free enterprise. Free enterprise to the president means taking money from the taxpayers and giving it freely to his friends. STEPHANOPOULOS: ... under Mitt Romney, and it was below 5 percent when he left. CUTTER: Right. So let me tell you the story about Massachusetts under Governor Romney. It did fall to 47th out of 50 in jobs creation. Wages went down when they were going up in the rest of the country. He left his successor with debt and a deficit, and manufacturing jobs left that state at twice the rate as the rest of the country. And there was a reason for this, because the governor didn't have policies to get the economy moving again. Remember, that recession that he blames ended almost a year before he was even elected, and the country was growing jobs. Six months before Massachusetts -- he created one job in Massachusetts. Now, at this point in his term, 40 months into his term, he had created about 4,000 jobs. At this point in the president's term, Massachusetts has created five times that amount in Massachusetts. The reason the unemployment rate went down, in part, according to independent analysis in Massachusetts, is because 250,000 people left that state. FEHRNSTROM: Well, I'd like an opportunity to respond to the political attack, and -- and that is, the magic number, here, George, is 4.7 percent. That was the level of unemployment achieved by Governor Romney in Massachusetts during his term in office. That's close to full unemployment. What does that mean? It meant anybody who wanted a job had a pretty good chance of finding one. I have no doubt that President Obama would happily trade his 8.2 percent unemployment rate for Mitt Romney's 4.7 percent. KRUGMAN: Massachusetts is a classic example, having nothing to do with current politics. It shows why America works as a currency union, while Europe doesn't, because Massachusetts had a terrible bust at the end of the '80s, and the unemployment rate eventually came way down, although there was no recovery in jobs. And the reason is people left, which is an interesting story, and it's good that people could find jobs elsewhere, but I don't think a president of the United States can solve our job problems by encouraging Americans to move to some other country to find work. FEHRNSTROM: Can I just say, on the jobs question, because this comes up repeatedly that Massachusetts was 47 out of 50 in terms of jobs growth. Actually, when Mitt Romney arrived, Massachusetts was an economic basket house. If you throw D.C. into the mix, we were 51 out of 51. By the time Mitt Romney left four years later, we were in the middle of the pack. We were 30th in the nation in terms of job growth. That's the trend line that you want to see. That's called a turnaround. And it's what this president has been unable to execute with the national economy. CUTTER: ... which I think we all follow. FEHRNSTROM: Well, that's where -- that's where these numbers come from. CUTTER: ... 36 out of 50 states when Governor Romney took office, and he was 47th when he left. STEPHANOPOULOS: I think you can also say that it's pretty safe that the Congress isn't going to do all that much between now and November. I wanted to bring another question about Mitt Romney's Solyndra tact, to you, Eric Fehrnstrom, because the governor was very strong on that, but just the day after he gave that speech, the Boston Herald, I think, reported that a solar energy company that Mitt Romney supported as governor of Massachusetts with his own green jobs investments went bankrupt. It was one of several that have come up in the last couple of days, so isn't this exactly the same story? FEHRNSTROM: Well, that was a loan that was approved by the prior administration. The governor made it clear that his philosophy was that government should not be in the business of venture investing. Actions he took as governor were to limit the state's ability to do that. He vetoed funds that were set aside for that purpose. What the president did with Solyndra simply exposes the hypocrisy of his attacks against Bain Capital and free enterprise, because the president's idea or his concept of free enterprise is government bureaucrats and politicians making investment decisions to reward their political contributors, which is exactly what happened at Solyndra, and it was a $500 million bust to the American taxpayer. CUTTER: Well, just as Mitt Romney was implementing a program started under a previous administration, the president was doing the same thing. This program was started under the Bush administration. The process for the Solyndra loan was started under the Bush administration, and the loan was given to Solyndra to -- to improve the clean-energy sector. Now, that loan didn't work out. And it's tragic that it didn't. But that's 1.5 percent of a larger loan portfolio that is actually working. We now have the largest wind farm in the world in this country, first nuclear power plant in 20 years is being created of this country. Because of the investments that we've made in the clean-energy sector, we've created almost 250,000 jobs. WILL: It was supposed to be 5 million. CUTTER: The president is not willing to cede the clean-energy industry to countries like India and China. If Mitt Romney wants to cede those -- that industry to India and China, then I think the American people deserve to know the real impact that's going to have not only on our competitiveness, but on our stability. KRUGMAN: Can I just -- these are -- these are -- we're talking as if $1 billion was a lot of money, and in $15 trillion economy is not. Solyndra was a mistake as part of a large program, which has been -- by and large had a pretty good track record. Of course you're going to find a mistake. I think, to be fair, that's probably true in Massachusetts, as well. But this is -- this is ridiculous, that we are taking these tiny, tiny missteps which happen in any large organizations, including corporations, including Bain -- Bain Capital had losers, too, right, even from the point of view of its investors? So this is ridiculous. And the fact of the matter is, this president has not managed to get very much of what he wanted done. He -- it's terribly unfair that he's being judged on the failure of the economy to respond to policies that had been largely dictated by a hostile Congress. STEPHANOPOULOS: We have a couple minutes left before we have to take a break, and I just quickly want to go to you, George Will, because you're calling this recall election in Wisconsin, coming up on Tuesday, Governor Scott Walker, the Republican, facing a recall, the second most important election this year. WILL: Yes, because it's a microcosm of what the country faces, an attempt to change the trajectory of the public sector. You have this extraordinary conflict there where unions are defending their privileged position. And it does look as though Wisconsin people are going to try and take that back. The man running against Scott Walker, Mayor Barrett of Milwaukee, has used the Walker reforms to save $19 million in the Milwaukee budget itself, so he's running against a man whose reforms he's emulating and using. KRUGMAN: And yet, of course, Walker is proposing tax cuts that will do much more to hurt the budget than any of these alleged savings. So this is -- it is a microcosm. It is -- it's not -- it's not fiscal responsibility versus irresponsibility. It is a vision of what kind of country you want to have and whether we're going to redistribute income upwards. WILL: A more than $3 billion budget that he inherited -- deficit has now become a surplus. STEPHANOPOULOS: Time to take a quick break right there. I want to thank Paul Krugman for joining us this morning. Everyone else is staying put, and Donna Brazile is standing by for much more on our powerhouse table. A. ROMNEY: It sounds like you all are fired up. STEPHANOPOULOS: The candidates' wives hit the trail this week. Is the women's vote starting to shift? Foreign policy fight. Conservatives question Romney, but he fires back at Obama. (UNKNOWN): What grade would you give President Obama? ROMNEY: Oh, an F. There's no question about that. STEPHANOPOULOS: And can't wait for George Will's take on the plan to ban Big Gulps. COLBERT: No more giant sodas? Come on. This is America, the land of plenty. We haven't even achieved Type III diabetes yet. STEWART: Wow, Mayor Bloomberg, wow. I love this idea. It combines the draconian government overreach people love with the probable lack of results they expect. What are you doing? M. OBAMA: I'm going to be out there a lot. I'm going to be traveling around the country. I love campaigning. And I say this all the time. If every American had the opportunity to travel around the country and go into people's living rooms and talk, we'd understand that we have so much more in common. A. ROMNEY: If Mitt wins, the country wins. If Mitt loses, the country loses. I really believe that. There is a sense in the country that we are in danger and that we have got to turn this country around. STEPHANOPOULOS: Michelle Obama, Ann Romney out there this week. We're back with our roundtable. Want to welcome Donna Brazile to join George Will, Stephanie Cutter from the Obama campaign, Eric Fehrnstrom from the Romney campaign. And, Stephanie, let me begin with you. On the women's vote itself, you see both campaigns going out hard at it. We had a new poll come out at ABC this week on Governor Romney's favorability. It showed a huge shift in the women's vote. He had gone about a 20-point shift in the last month now, only trailing President Obama by about 11 points. It was about 30 back in April. What happened? CUTTER: Well, you know, George, I think that the Republican Party is consolidating around Mitt Romney now that he is the nominee, and that includes Republican women, but different polls show different things. On the same day that poll came out, there was another poll by one of your competitors that showed the gender gap at -- by a bigger margin than we even won it in 2008. And there were two, I think, interesting things about the ABC poll this week that is really telling about where the election is. One, women believe that Barack Obama understands their economic problems more than Mitt Romney does and, number two, that he will take care of the middle class and help grow the middle class compared to Mitt Romney, where they would singled out that he would help the wealthy and financial institutions. And I think that really just symbolizes the debate we're having. How do you grow the economy? Do you grow it from the top down? Or do you grow it from the middle out? FEHRNSTROM: I think women view this election through the prism of their own family. Women, like all Americans, are feeling squeezed by this Obama economy. In many cases, women manage households. They're responsible for paying the bills. And they're scrimping and saving to buy groceries and maybe put a little bit of money aside to send a kid to summer camp. I think it's about not so much themselves, but about their children and whether or not their children will have it better than they did, and they don't believe that's the case today. STEPHANOPOULOS: And Romney coming back among married women. BRAZILE: Well, look, he's coming back, a little consolidation there, but it's not enough, I believe, to break out in a sweat right now. But here's what's important. The economy, very important for women voters, very important for single women out there. And if President Obama can continue to make the case that he has the policies, the right policies, the right ideas to move this economy along, to keep it healing, to keep it to growing, that he'll -- that gender gap will only grow larger. WILL: Isn't there something patronizing and condescending about talking about the -- definite article -- the women's vote, as though it's a simple and big block? You've pointed right there to one division between the married and the unmarried. I think Romney's carrying married women at this point. But there's been a gender gap for election after election after election. But you know how far back into the mists of American history you need to go to find an election cycle when the Republicans carried the women's vote? Twenty months. In 2010 congressional elections, they carried the women's vote. BRAZILE: Well, the gender gap has been alive since 1980. That's when we first saw a difference between how women voted versus men, but the economy is an issue, but also women are showing some hesitation of supporting Republicans based on their own reproductive lives. STEPHANOPOULOS: I want to pick up on that, because there's a pretty remarkable article in New York magazine this week by John Heilemann, went inside the Obama campaign, and included this quote from David Plouffe, the president's chief political strategist inside the White House right now, talking about how they were going to use social issues. I want to bring this to you, Eric Fehrnstrom. Here's what he said. He said, "We're going to say, let's be clear about what he, Mitt Romney, would do as president. Potentially abortion will be criminalized. Women will be denied contraceptive services. He's far right on immigration. He supports efforts to amend the Constitution to ban gay marriage." They go on in the article to say, you know, they're going to Mitt Romney as a man of the '50s, retro, backwards, that's not where America wants to go. FEHRNSTROM: Well, good luck with that. Mitt Romney is pro-life. He'll govern as a pro-life president. But you're going to see the Democrats use all sorts of shiny objects to distract people's attention from -- from the Obama performance on the economy. This is not a social issue election, George. This is going to be about the president's handling of the economy. It's a referendum on his performance, and, frankly, right now, he's getting a failing grade. STEPHANOPOULOS: Good luck with that? CUTTER: Well, good luck with that. If it's not a social issue election, then why did Mitt Romney just spend the last year campaigning on social issues? These are his positions that he's taken, whether it's, you know, giving bosses control over whether female employees can get contraception, being for the so-called personhood amendment that would ban all forms of abortion, or, you know, telling the American people that he'll get back to them on whether he supports Lilly Ledbetter, which is an economic issue and it should be a no-brainer, but the governor couldn't even bring himself to be for that. So we agree, the economy is the number-one issue. Women want to see two candidates compete on their visions for the economy, which is what I was getting at before, whether you want to build an economy from the middle out or the top down. STEPHANOPOULOS: So how much do these issues matter? I still can't figure it out listening to you two. CUTTER: Well, I think that for the -- you know, getting rid of Planned Parenthood or the number of other social issues that the governor injected to this campaign, I think women don't like that intrusion. What -- what Mitt Romney is really saying that he's going to do is use government to intrude into their lives, and I think that they resent that. And that's one of the reasons that the gender gap blew up so much during the primaries. FEHRNSTROM: George, it was a year ago yesterday that Mitt Romney went to a small farm in Stratham, New Hampshire, and he announced his candidacy for president. At that time, he laid out the issues that were compelling him to get into the race. Primarily, it was because he didn't believe that this economy was headed in the right direction. He also talked about the massive debt burdens that we were accumulating and would be passing on to our children and our grandchildren. That's why he's running for president, and that's why he's going to win in November. BRAZILE: And, Eric, and that's why he's put forward the same proposals that have gotten us in this fiscal mess that we're in. I mean, a recipe of more tax cuts, more, you know, tax subsidies, that's not going to bring this economy back. It's healing slowly, 27 consecutive months of job growth. Of course, it's not enough jobs, but the fact is, is that Mitt Romney's proposals will add trillions to the deficit, and you haven't addressed that. STEPHANOPOULOS: George, I think we're seeing something play out, a microcosm here, and I wonder if it's going to tell us something about the campaign. Even when other issues come up, everything does drive back to the economy and the economic issues. WILL: Exactly. Now, Stephanie said a moment ago, the question is whether women can get contraception. The question that we've been litigating in public this spring is whether women can get someone else to pay for their contraception (inaudible) no one is talking about blocking access to contraception. You said people are worried about whether the government will intrude in their private lives. No, they're worried about whether the government will intrude into the life of churches, such as the Catholic Church. So these issues tend to explode and damage almost everyone, which is why at the end of the day we're all going to swerve back to the question of who's going to put us to work. BRAZILE: Well, there's been so many attacks on women, George, and it's -- and it's not just out of Washington and the Republicans. It's in states all over the country. I mean, it's -- there's been so many attacks on women, one would think that the Republicans would at some point just cease. I mean, the attacks on Planned Parenthood, the Republicans have always said that they are parents. So what is it you're against, planning? WILL: When did -- since when did Planned Parenthood become a synonym for American women? BRAZILE: Because Planned Parenthood proves a broad range of reproductive health services for women, life-saving medicine, mammograms. This is about, of course, testing for diabetes and so many other important programs. That's why the attacks on Planned Parenthood has alarmed so many women in this country. STEPHANOPOULOS: Each man is also running to be commander-in-chief. President Obama, of course, already is commander-in-chief. And, Stephanie, you saw that -- a clip we played right before we went to commercial, Governor Romney the other day giving President Obama an F on everything, including foreign policy. Your response? CUTTER: Well, I think that it's what Colin Powell said of Mitt Romney's foreign policy. You know, Mitt, think. Get real. And I think, you know, Mitt Romney saying that Barack Obama gets an F is one of the most ridiculous things that he has said in this race. Let's just go over the president's record, ended the war in Iraq in a responsible way. We're on track to end the war in Afghanistan. We crippled Al Qaida and brought bin Laden to justice. You know, he led to topple Gadhafi and protect the people of Libya. You know, that's just a sample of what he's done. Now, Mitt Romney calls Russia our greatest geopolitical foe. You know, that's what you were saying before, about going backwards instead of forwards, that he would go back to the '50s to talk about Russia as our worst geopolitical foe. And on -- you know, of the bluster that we hear from Governor Romney, whether it's criticizing our Iraq policy and promising that he would leave troops on the ground in Iraq, with no promise of ending the war, or the number of different proposals he put out on Afghanistan, again, with no promise to end the war, or, you know, stating that he wouldn't move having the nerve (ph) to get bin Laden. I think that the governor is picking the wrong fight in this election if he's going to take on Barack Obama on foreign policy. FEHRNSTROM: Look, the killing of bin Laden was a great achievement for America. Governor Romney credited the president for that. He also gave credit to the intelligence agencies that were involved in searching him out and, of course, to the members of the military, he carried out that mission. But the measure of America's foreign policy is, how strong is our influence in the world? And our influence is dependent on two things: our economic strength and on our military strength. FEHRNSTROM: ... that is emboldening our adversaries and weakening our influence around the world. STEPHANOPOULOS: Don't you -- don't you need -- doesn't defense have to be a part of reducing the debt? FEHRNSTROM: One trillion dollars over the next 10 years, that's level of reduction that the secretary of defense called devastating. That needs to be changed. But this president hasn't taken any action at all to stop this sequestration process from happening. STEPHANOPOULOS: Where does this debate go? WILL: Well, it goes to Syria, first of all, which is the fact, do we want to become involved, as we're withdrawing from two wars in the Middle East, do we -- and that region, do we want to get involved in a third, that is, do we want to get involved in a civil war, in a sectarian tribal society? Governor Romney says we should be taking more assertive action to change the Assad regime. I don't know what that means. The question is, what does it mean? FEHRNSTROM: I'll tell you what it means, because he -- he spelled it out. There are -- there are two things that we can say about the opposition in Syria. They're very brave, and they're not going away. What they need is the capacity to wage a fair fight. So what Governor Romney would do is encourage the United States to work with our partners, to identify, organize, and arm the opposition. I mean, these are very brave people, and they're going up against vastly superior forces in Assad's army and have suffered 10,000 losses, just slaughtered by the government. WILL: But a few decades ago, we armed the opposition to the Russians. We armed the Taliban in Afghanistan, and that didn't turn out so well. FEHRNSTROM: Well, of course you -- well, of course you have to be careful in -- in selecting your partners within the opposition. But let's step back for a moment, because for the last year-and-a-half, this president has not engaged in organizing moderate forces within that opposition. So to the extent that there's a vacuum that's being filled by bad actors, that is the president's fault. WILL: But once we start, it's hard to stop. We entered the war -- the civil war in Libya to prevent in Benghazi, one city, a humanitarian disaster. A no-fly zone soon became searching for targets on the ground. We didn't have mission creep; we had mission gallop. And eight months later, we were implicated in changing the regime. How do you stop once you engage? FEHRNSTROM: Well, the governor's not talking about intervention. FEHRNSTROM: What he's talking about is arming the opposition so that there's a level playing field. BRAZILE: The chair -- the chair of the House Intelligence Committee and the ranking member believe that that is the wrong strategy, because we simply don't know who they are and exactly what they will do with those weapons. Look, Mr. Assad has turned out to be just like his daddy, a brutal dictator. Kofi Annan has it absolutely right. The Arab League and others in that region have to play a much larger role in trying to end the violence and getting Assad to leave, so the question is not, you know, if he should leave. It's when he should leave. STEPHANOPOULOS: Well, and the other question is -- I think George Will pointed up a lot of the questions about the governor's plan -- but what more can President Obama do right now to help push Assad out? CUTTER: Well, we're doing everything possible to isolate that regime, whether it's leading the world to expel Syrian diplomats from our allied countries, you know, tough sanctions on Syria, everything we can to isolate and move the U.N. towards taking action. And, you know, the president is committing to toppling the regime in Syria, but we have to do it in a responsible way that protects our own interests. And, you know, as Donna said, the House Intelligence Committee, which actually knows what it's talking about here, disagrees with Governor Romney about arming the opposition. If you arm the opposition, then you are responsible for wherever those arms end up. And I don't think we know that yet. STEPHANOPOULOS: Let's take a quick break. Right now, we'll be back with the roundtable in just 60 seconds. Michael Bloomberg and John Edwards, he avoids jail, what's next? EDWARDS: I don't think God's through with me. I really believe he thinks there's still some good things I can do. BUSH: Thank you so much for inviting our rowdy fans to my hanging. When the British burned the White House, Dolly Madison famously saved this portrait of the first George W.
Now, Michelle, if anything happens, there's your man. And I'm also pleased, Mr. President, that when you are wandering these halls as you wrestle with tough decisions, you will now be able to gaze at this portrait and ask, "What would George do?" STEPHANOPOULOS: A relaxed and funny George W. Bush at the White House this week, as his portrait was unveiled. We're back with a roundtable, and I guess quite different scene from Greensboro, North Carolina, where John Edwards left the courtroom, not guilty on one charge, hung jury on five others of campaign fraud. And when he came out for the first time, he mentioned his daughter, Quinn, who he had with Rielle Hunter. EDWARDS: Finally, my precious Quinn, who I love more than any of you could ever imagine. And I am so close to and so, so grateful for, so grateful for Quinn. STEPHANOPOULOS: Donna Brazile, the first time he had mentioned her in public. He does avoid any jail time, almost certain that the Justice Department is not going to bring this again. I talked to several of the jurors on Friday. They didn't even think it was a particularly close case. But can he really come back? You know, he had that phrase saying God is not finished with me yet, a little Jesse Jackson there. BRAZILE: Well, if he's listening to God, I hope it humbles him and that he spends as much time as possible being a good dad to all of his kids and a good man. John Edwards was caught up in a series of lies, lies that he could never unravel and lies that perhaps destroyed his family, but clearly destroyed his public reputation. I don't know if there's a road to redemption. I hope so, because I believe in redemption. But I think for now, John Edwards would be wise just to mellow, chill, and just be with his family. STEPHANOPOULOS: And, George Will, maybe -- maybe the same advice for the Justice Department's public integrity (inaudible) some of the jurors I spoke to thought the case shouldn't have even been brought. And they've had a pretty bad run. WILL: They have. But I'm glad they did bring this to trial, because I think it served two public functions. The first is the jury, by acquitting him and by hanging on other issues, said essentially that the rule of law presupposes that the law will give the citizen due notice of what behavior is mandatory and what is proscribed. And they said in this case, who knows? And that's the second point. This case dramatized how baroque and murky the laws encrusting our political activities have now become. It's not unusual, as you know, for a campaign to spend 15 percent of its money on lawyers, just to try and decipher this. STEPHANOPOULOS: How careful are you two now on anything dealing with, you know, the crossover between campaign -- well, you're both in the campaigns right now. Do you think about that, the idea that at some point lawyers or somebody might be looking? CUTTER: Well, I mean, I agree with George that our campaign finance laws are arcane and complicated, and you need to be careful. We obviously have lawyers working on the campaign to ensure that we're doing everything by the book. So I can't speak for Eric, if he's talking to lawyers at all. FEHRNSTROM: Well, in terms of campaign finance, of course, there are -- there are lawyers associated with the campaign that make sure that the raising of funds is all done according to law and regulation. And I know that, you know, there's an effort, constant effort to make sure that the campaigns -- both campaigns -- are in compliance with the law. STEPHANOPOULOS: But it is a massive problem, George. Obesity is a problem across the country. WILL: Of course it is. And regulating the size of these drinks at some outlets will do nothing about it. By the way, the sale of sugary, carbonated sodas has fallen 24 percent since 1990. The American people are getting the word on this. But what this really says is -- what Bloomberg is saying, the government helps with your health care, the government's implicated in your health, therefore, we own you, therefore, the government can fine-tune all the decisions you make pertinent to your health. STEPHANOPOULOS: You're free to buy two, I guess. STEPHANOPOULOS: That's got about twice as much sugar as soda, right? BRAZILE: Well, not the way we made it in Louisiana. WILL: But this is one of the reasons liberals are so enamored of the issue of climate change. They say all our behavior in some way affects the climate. Therefore, the government -- meaning, we, liberals, the party of government -- can fine-tune all your behavior right down to the light bulbs you use. STEPHANOPOULOS: Wow, the leap from soda to climate change. Donna, you get the last word, 10 seconds. BRAZILE: George, all I could tell you is that this is a very serious concern and I commend the mayor for raising it and also giving you something to drink about. STEPHANOPOULOS: George Will, Donna Brazile, Stephanie Cutter, Eric Fehrnstrom, thank you all very much. Terrific roundtables today. And we will be right back. STEPHANOPOULOS: I'll be back to answer the questions you had for us this week, but first, we honor our fellow Americans who serve and sacrifice. This week, the Pentagon released the names of 13 servicemembers killed in Afghanistan. STEPHANOPOULOS: Finally today, "Your Voice This Week," where you ask the questions. And today's comes from Edison Palmer. How do you choose the folks on the panel? George Will is great. Well, I couldn't agree more. That's why George has been kicking off the roundtable for more than 30 years. And each week, we look for a mix of guests with different points of view who also have George brings to the table, a strong voice backed by solid reporting, research and experience. We want a lively and informed debate that makes you want to join in and continue the conversation at home. That's what we aim for. Let us know when we hit and when we miss. And we'll be right back with a look at the Queen's Jubilee. STEPHANOPOULOS: That's all for us today. Check out "World News" with David Muir tonight. And look at this. Just moments ago, the queen arrived at Chelsea Pier in London for her Jubilee pageant. As we leave you this morning, enjoy this look at the pageant as it winds its way down the River Thames, 1,000 boats there celebrating for the queen. And don't forget that tomorrow on "GMA," Robin Roberts and Lara Spencer anchor live coverage of the Jubilee from London. Thanks for sharing part of your Sunday with us. I'll see you tomorrow on "GMA."